Styling themselves as the young heroes of vigilante justice-type Tamil blockbusters such as “Kuruvi” and “Ayon”, two teenage lovers ruthlessly planned the wickedest of crimes – the murder of parents.�Their tempers had reached boiling-point after 47-year-old Sivaguru Raghu had caught them in a bedroom at night. Raghu’s 16-year-old daughter had been known for her promiscuous behaviour, and he had warned her repeatedly to change her ways. When her current boyfriend, whom she had known for only six months, had been found in her bedroom Raghu, a merchant in Chenkaladi, near Batticaloa, had assaulted the boy and kicked him out, and scolded his daughter. A month later, on April 8, Raghu and his wife, Sundaramoorthi Vifra, were butchered as they slept, murdered by the teenagers and a couple of their O-Level classmates from Chenkaladi school. The 16-year-old girl who masterminded the crime and her boyfriend are now in remand until this Wednesday (April 24), having confessed to the killings. They were arrested on April 13, New Year’s Day. Police investigations continue, and the inquest into the murdered couple’s deaths is still to be held. The girl told police that she and her lover had been inspired by plots depicted in two violent films, “Kuruvi” and “Ayon”. They had dreamed up a number of scenarios for carrying out the perfect murder. In the end, they had planned to kill the girl’s parents during the school holidays. The couple told police how, intent on leaving no clues to the planned killings, they had bought gloves and stockings in Batticaloa in preparation for the crime.�A few days before the murders, they had visited the Chenkaladi and Eravur hospitals to obtain sleeping pills. One unsuspecting doctor dispensing the drugs had advised the boy not to sit too long in front of his computer. On April 8, the teenage killers’ plans were set.�Raghu and Vifra had left home as usual to work in their grocery shop, 500m away at Chenkaladi Junction, on the A5 Batticaloa-Badulla road. Their 18-year-old eldest daughter was also out of the house. The 16-year-old daughter had known that her parents were going to close their shop early to go shopping in Batticaloa for clothes and presents for the family for the New Year. The mother had cooked a fish curry for dinner early in the day, knowing that they would be home late and tired from the festive shopping. The couple had taken their young daughter along for the shopping trip. From a van bound for Batticaloa, seated only a little distance from her parents, the girl had used her phone to contact the boyfriend and tell him the coast was clear. He and the two classmates had arrived at the empty house and mixed the ground-up sleeping tablets into the fish curry gravy. The eldest sister was the first to eat the curry but, disliking the taste, had found an alternate dinner at her grandparents’ home nearby. She slept there that night. The doomed parents and their youngest daughter had then come home and sat down for dinner. The parents had complained of a sour taste in the fish curry and stopped eating it, finishing their dinner with mutton curry from Sundaramoorthy’s parents’ house. The panicking 16-year-old rang her boyfriend at 9p.m. ; their plans were going awry: the doped curry had been thrown away and the parents were not going to be easy victims for slaughter. The boyfriend and his two friends arrived at the house around 11:10 p.m., having told others they were going to a party. They were armed with knives and a pickaxe handle.�They went to the girl’s parents’ bedroom and cut the mother’s throat.�Awoken by the disturbance, the father had put up a fight. The scuffle had lasted a long time as he was stabbed and hacked repeatedly, including on his face, but eventually he died. His body had nine stab wounds, according to police. Pitiful evidence was given last Wednesday to Magistrate K. Karunaharan by the father of the murdered woman, Mr Ponnudurai Suntharamoorthi.�He said that around midnight he had heard sounds of blows from the direction of his daughter’s house, just in front of his own dwelling. “I looked towards my daughter’s house, and I heard screaming. I went to the kitchen side (and tried to get inside but) the doors were closed.”�He had peered through a gap in the window.�“I saw a person beating my son-in-law. Although the electric light was on I could not identify the person through the small hole in the window. I didn’t know what to do, and I ran here and there. “Then I heard the sound of a door bar being lifted and dropped and saw a person running away.�“I went back to my daughter’s house and called my son-in-law, ‘Thambi, thambi’. There was no answer. Then I shouted for my daughter – no answer. “My grand-daughter, who had slept in that house, got up and called. I shouted to her to open the door from the kitchen side. After opening it, she asked me what the matter was. I said nothing and went into my daughter’s bedroom.�“There I saw my daughter and my son-in-law in a pool of blood. I called the neighbours but no-one came. “I rushed to the hospital, which was (close by) and related the situation. They told me to inform the police on duty at Chenkaladi junction, and the police came straightaway.”�The police found no evidence that the murders had been committed by strangers. They questioned the family repeatedly and began noting contradictions in the answers given by the 16-year-old girl, and also a gradual change in her behaviour as she grew more subdued and reticent. In one early statement the girl had claimed ignorance of the killings.�“On the 7th evening, at 4.30pm, I and my mother, father, and sister all went to the textile shop to purchase dresses and returned home that night.”�She said her sister had complained that the fish curry was bitter but her mother had disregarded her comment “until my father also ate it and said it was so. We threw the curry away and had the mutton curry cooked at my grandmother’s house. The killer’s evidence changed on crucial details as she was questioned again and again. Finally, she confessed to the murders. The boyfriend also confessed. 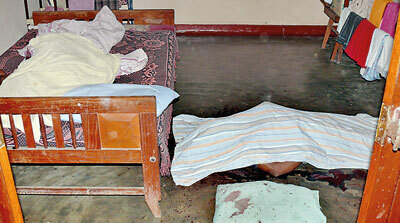 They said they had hidden their blood-soaked clothes and gloves in a patch of forest in the Chenkaladi-Ammanpuram area. On Wednesday, more details of the cold-blooded murders could come to light.